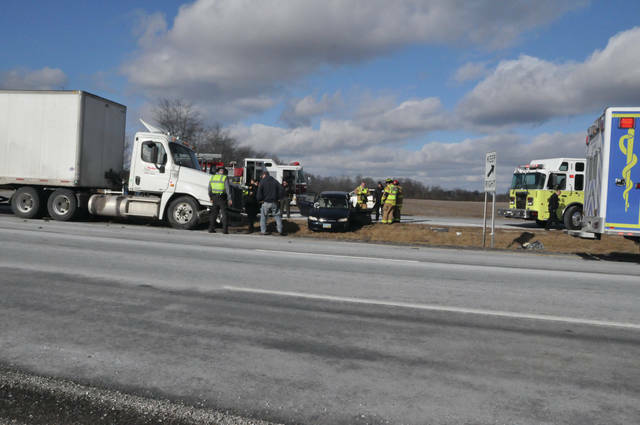 A car and a tractor trailer were involved in a collision around 2:45 p.m. on Tuesday at the junction of US 36/State Route 37 and Big Run Road. According to a Delaware County sheriff’s deputy, the car apparently failed to yield when pulling out of Big Run and was struck by the semi. The driver of the car, an unidentified woman, suffered non-incapacitating injuries and was transported to OhioHealth Grady Memorial Hospital by Delaware County EMS. Her condition was not available at press time. The man driving the truck, owned by CVS Pharmacy, was not injured. US36/SR37 was not closed following the crash. Also on the scene were the BST&G Fire District and the Ohio State Highway Patrol.